FRAMINGHAM, Mass.--(BUSINESS WIRE)--Staples, Inc. (NASDAQ: SPLS), an industry leader in sustainable efforts, found that more than 90% of businesses practice some form of eco-friendly activity regularly, including recycling, making energy-efficient choices, and/or shopping for more eco-friendly products. The findings come from the Staples sustainability survey, conducted by Frank N. Magid Associates, Inc. to further understand the commitment of businesses and consumers to sustainability in the workplace and at home. This 2016-2017 customer sustainability survey was conducted online, among 600 U.S. consumers and 1,300 businesses (small businesses to commercial and enterprises), from December 28, 2016 to January 6, 2017. Those surveyed were the office or household product and service decision-maker or influencer. Earlier this month, ENERGY STAR recognized Staples for its energy efficiency practices, awarding the company an ENERGY STAR Partner of the Year Award for the eighth year in a row. This recognition is just one of the many ways Staples is leading the industry in various sustainable practices including conserving energy, selling more sustainable products and recycling. In 2016, Staples, the only retailer to offer completely free electronics recycling year round, helped customers recycle more than 25 million pounds of office technology and sold more than $4 billion in products with environmental features globally. During Earth Week (April 16- April 22) Staples is further incentivizing customers to make greener choices with various electronics recycling offers and discounts on select eco-friendly office essentials including Staples® Sustainable Earth ™ products. Electronics Recycling - While Staples offers free electronics recycling all year round, during Earth Week Staples Rewards members who recycle old electronics will receive a coupon for $10 off their next purchase of $30 or more. The offer is redeemable in store for Rewards Members only. Customers who are not already Rewards Members can easily sign up online or in-store to be eligible for the coupon. 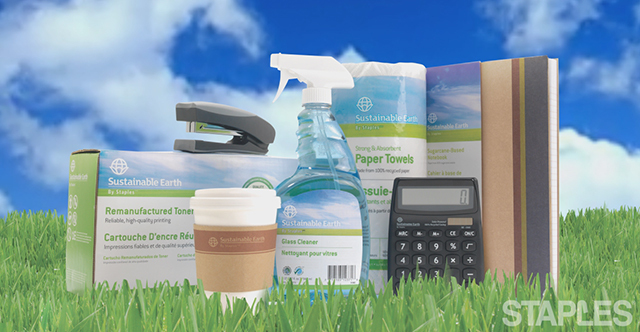 Eco-Friendly Office Essentials Including Sustainable Earth™ by Staples - During “Earth Week” customers can enjoy 30% off their online purchase of select eco-friendly office essentials. 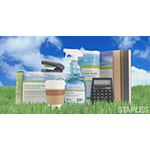 Staples® Sustainable Earth ™ products include high-quality surface cleaners, recycled paper products and office supplies that are economical and sustainable for a range of needs. For more information on how Staples is helping customers be more sustainable at work and at home, visit http://www.staples.com/sustainability. Staples helps business customers make more happen by providing a broad assortment of products, expanded business services and easy ways to shop – in stores, online via mobile or through social apps. Staples Business Advantage, the business-to-business division, caters to mid-market, commercial and enterprise-sized customers by offering a one-source solution for the products and services they need, combined with best-in-class customer service, competitive pricing and a state-of-the-art ecommerce site. Headquartered outside of Boston, Staples, Inc. operates primarily in the United States and Canada, with additional operations in South America and Asia. More information about Staples (NASDAQ: SPLS) is available at www.staples.com. Staples Sustainability Survey Finds that 90% of Businesses Engage in Sustainable Activity Regularly.